A couple of researchers for World Chess have put together an interesting article on the amount of money the top chess professionals are making. Don't think anyone is going to be shocked by the conclusions that in 2018 it wasn't very much! At least in terms of prize money as Carlsen may be making quite a bit more in endorsements. Have they missed out the Isle of Mann? is right up there. The number of participants, four, is the lowest with who ever came 4th getting 35,000 euros. Also the number of games each player played, just two! is the lowest number of games played. We played against this lot once. It's a fact. 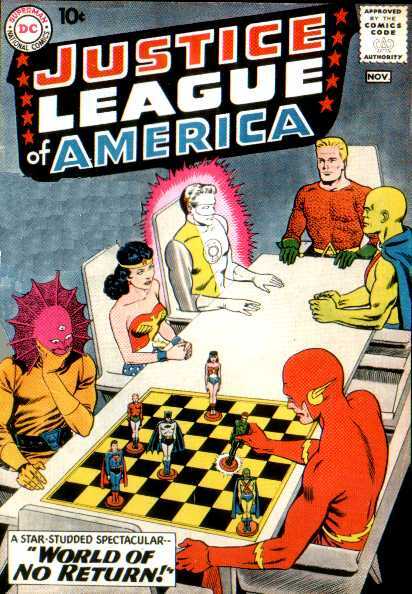 The Justice League of America had a team in the 4th Division of the Edinburgh Chess League. I took along a team of Bells punters to play at their venue. 'The Golden Glowing Super Hero Palace' (13 Scroggs Lane). Flash. Don't talk to me about Flash. He lost on time! The Invisible man did not turn up and lost by default. They claimed he was there but we could not see him. Aquaman stank of fish, and the Hulk.... Gosh! what a sore loser, I've never seen anything like it. Most players knock over their King. This nutter knocked over the building. I played Brainiac on board one. As soon as I saw the size of this guys head I knew I was in trouble. Quite a memorable match. Mickey Rattray pulled Wonder Woman. Potentially, but given the standard of the research involved, it appears to be about as useful for practical purposes as you would expect from World Chess. Even if you ignore team chess / appearance fees, this whole piece is utter nonsense - Mickey won the British last year, the prize money he’d have got just for that is more than €9,000. Natalia Pogonina is one of the only players on the list that I’ve seen interacting with WorldChess on this - she also points out that she’s won more prize money in a single tournament than they list as her earnings for the whole year. WorldChess have said that they aren’t allowing for national championships, except that the US and Russian champs are in their list of tournaments - I assume they must have included these in their calculations else I don’t see how Shankland ends up so high on the list. And as Angus points out, they’ve missed tournaments that clearly do fit their criteria - Isle of Man being a very good example. And what message are they trying to give? Say I’m a promising 15-year-old (I wish...) thinking about chess as a career. This is saying to me that if I manage to get to #4 in the world (Giri) I might manage to make €25k per year. Do I go for it on that basis? Even if you ignore team chess / appearance fees, this whole piece is utter nonsense. Out of interest, I had a quick go at trying to work out what Giri won (ie prize money alone) in 2018 based on his FIDE profile and a bit of Googling. He actually wasn’t hugely active so the number’s a bit lower than I expected - but still about double what WorldChess have. The figure for Sparkassen is a guess - he came second in an elite round-robin. Shamkir is a minimum based on his shared position, it wasn’t clear whether he got more than this based on tie-breaks. Tata Steel feels low to me (1st equal with Carlsen) but those were the published figures. Possibly they give better appearance money? "Tata Steel feels low to me (1st equal with Carlsen) but those were the published figures. Possibly they give better appearance money?" Given the generally awesome strength of the event, you're probably right. So Giri won 58,000 Euros in prize money, and is ranked number 4 in the world? Last week, snooker's World Grand Prix featured the top 32 players in the world on the 1-year ranking list; i.e. the money won since the end of the World Championship last May. So there are still plenty of tournaments, the China Open and World Championship being particularly big money to go this season. The number 4 on that list, Mark Williams, had £201,000. A snooker player winning 58,000 Euros at the current exchange rate would only have been good enough in snooker to get into the World Grand Prix as the number 32 seed out of 32. And that doesn't include a number of non-ranking events, of which The Masters and Shanghai Masters had the most prize money available, in fact they are 3rd= in terms of the size of the winners prize - £200,000. In darts, the current 4th place in the rankings on the 2-year Order of Merit is Gary Anderson, who won £568,250. So that's about £284,000 per season. And again, that doesn't include non-ranking events like the Premier League, The Masters, and the World Series of Darts events. 58,000 Euros is about £100,000 over two years. That'd be good enough for 45th in the PDC Order of Merit. In golf, the PGA Tour #4 has won over $2,000,000 this season already, from five events, going back to last October after the Tour Championship. 58,000 Euros, in dollars, would be good enough or 176th on the PGA Tour Order of Merit. And the season is only a few months old, which most of the major events with the biggest prize money coming later in the summer. I can't find similar statistics for tennis, which tends not to focus on prize money. I think the general thrust of the World Chess article is worth thinking about; the chess player ranked 50 in the world will find it much harder to make a living than the equivalents in other sports. In other sports, the player ranked 50 can at least be a "journeyman pro", to some extent, playing as a professional on a tour earning enough to make a living. What does the equivalent chessplayer have? National Championships, National Leagues (perhaps more than one), Open tournaments (perhaps hoping that the highest-ranked players don't enter). A series of independent tournaments with no unifying structure to them at all, except the FIDE rating list to which they contribute. The money mentioned in the article is obviously inaccurate, but chess could certainly learn from the professional structures surrounding other sports that provide good money to 100+ players. The GCT is the closest thing to a properly organised chess tour, but it's no good if you're not one of the select 12. It seems so - though perhaps he was a bad example as for whatever reason, he didn’t play all that many tournaments last year. There are people lower down the rating list (eg Nakamura) who won much more prize money, even on the WorldChess list. I also wonder whether the appearance money vs prize money structure is different for chess than some of these other sports - as I mentioned above, Tata Steel’s prize fund looks very low but I think they pay the top guys quite a bit for turning up. I agree there’s a discussion worth having on prize money, organisation of top tournaments, etc, but I don’t think the WorldChess approach of just throwing out some numbers that can be trivially disproved is a helpful way of starting that discussion. My experience of low-level pros (the likes of Hebden, Arkell etc) is that they tend to be loss-averse when it comes to tournament chess, and you can get them far cheaper by putting money into a conditions fund than you can by putting it into a prize fund. If that dynamic repeats itself at higher levels, it's a very good explanation for apparently low prize funds. In other sports, the player ranked 50 can at least be a "journeyman pro", to some extent, playing as a professional on a tour earning enough to make a living. What does the equivalent chessplayer have? National Championships, National Leagues (perhaps more than one), Open tournaments (perhaps hoping that the highest-ranked players don't enter). There are at present 42 players with FIDE ratings above 2700. My guess ( not informed in any way by this latest piece of work ) is that in 2018 every one of them made a tolerable living - don't forget stipends earned playing for their national team. One problem faced by many talented chess players, and I suspect not shared by, for instance, most top soccer players, is that they have brains which are suited to earning tempting fortunes in high finance. It possibly even depends on the Federation. The cost of living is higher in the UK and USA than it is in, say, India or Russia. It is certainly true that very gifted young players are often also excellent academically, and there comes a point in their teenage years when they have to decide between a potential chess career or a "normal" job. In England's case, Ameet Ghasi is the example that springs to mind as someone who chose a normal job. I think the general thrust of the World Chess article is worth thinking about; the chess player ranked 50 in the world will find it much harder to make a living than the equivalents in other sports. ....provided we consider other sports which are more popular than chess.